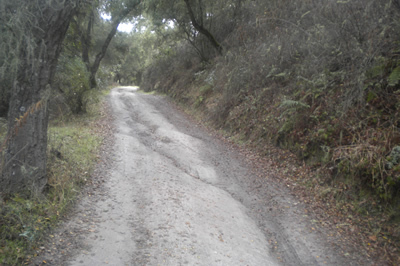 Unpaved rural road systems are now widely recognized throughout California as being one of the most significant and easily controlled sources of erosion resulting in sediment delivery into waterways. Excessive erosion and sediment delivery to stream channel systems reduces channel flood conveyance capacity and compromises wildlife habitat and water quality. The most common and disconcerting problem encountered on dirt roads is the potential of erosion to close roads, cause injury, and compromise the health of terrestrial and marine habitats. Highly erosive soils, large winter rain events and the steep terrain of our watersheds combine to make our roads susceptible to high rates of erosion. Inadequately constructed and maintained roads within this environment continually add sediment to the waterways of Monterey County and the Monterey Bay National Marine Sanctuary. Maintenance of residential and ranch roads is an important and complex subject. Many forest and ranch roads were designed and built to capture runoff and transport it in ditches and culverts. When these structures fail, they cause damage to the road, ranging from minor problems (a few ruts) to major hazards (washouts, stream diversions, large ruts) that make the road impassable. Annual maintenance can be time-consuming and costly. Three techniques in particular (outsloping, rolling dips, and proper culvert installation) can result in multiple benefits when properly implemented, including: reduced erosion, reduced sedimentation of water courses, improved natural drainage, improved reliability, and overall reduced maintenance costs. Creation of new roads or drainage improvements of existing roads is best guided by a qualified engineering geologist, especially in steep terrain with stream and swale crossings. The RCD and NRCS have assisted Monterey County landowners with simple road assessments and have coordinated funding for hiring professional geologists for more challenging sites. Especially for roads in watersheds that host steelhead trout, the state resource agencies have demonstrated support for rural road work by funding drainage improvement projects.